NC Automation Engineering CC is an automation project house established in Johannesburg since 1988 and dedicated to quality solutions. They were approached by a customer who wanted to monitor the long term performance of a number of electrical steam boilers all over Natal. The customer was currently using a number of laptop computers with custom written software which were left on site to interrogate the boiler controller and log certain measurements at a regular interval. The laptop computer would have to be dropped off and fetched a few weeks later from sites to retrieve the data making the laptops vulnerable to theft. The laptops, traveling between sites and time to retrieve and report on the data made the whole exercise quite costly. NC Automation designed a small wall mountable lockable IP65 box for the customer with a TelePAD connected to a cell modem powered by a battery which is recharged with a trickle charger. The TelePAD is connected to the boiler controller and at a user defined interval interrogates the controller via its serial port, timestamps and logs the returned steam measurements to a csv (comma separated variable) file in the TelePAD flash memory. The TelePAD provided enough disk space to store around 3 months data on board at typical logging rates. This logged data can then be retrieved from any PC either locally with a null modem cable or remotely with a modem by establishing a dial-up connection to the Telepad, logging onto the PAD with the password and transferring the file using FTP from Internet Explorer. The csv report file can then be opened directly in Excel. 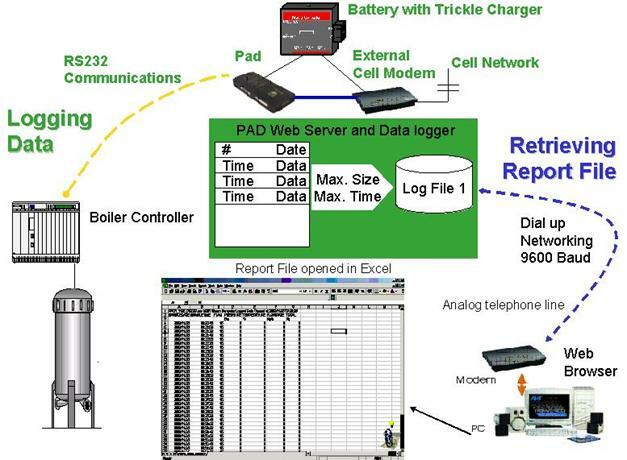 The TelePAD unit was ideal for this remote data logging application. The PAD provides data storage, serial communications, data security, open standard platforms for data retrieval and configuration changes in a robust (no blue screens! ), small package for reasonable cost and the SANScript option provided the ideal commands to handle the boiler controller serial protocol and write the report file. For the customer, the unit can be set up on site and left safely until needed elsewhere. The historical report file is automatically generated and can be retrieved into Excel from anywhere at any time for the price of a phonecall making the reporting mechanism more convenient, faster, easier and much cheaper.